Litletinden (1235) as seen from Sørfjorden. From Alpine Journal 1900-01: New Expeditions in 1899. SOMMERBUGTTIND (FIRST ASCENT) (aka Store Rieppefjellet, 1295 m). west of the Sørfjord. 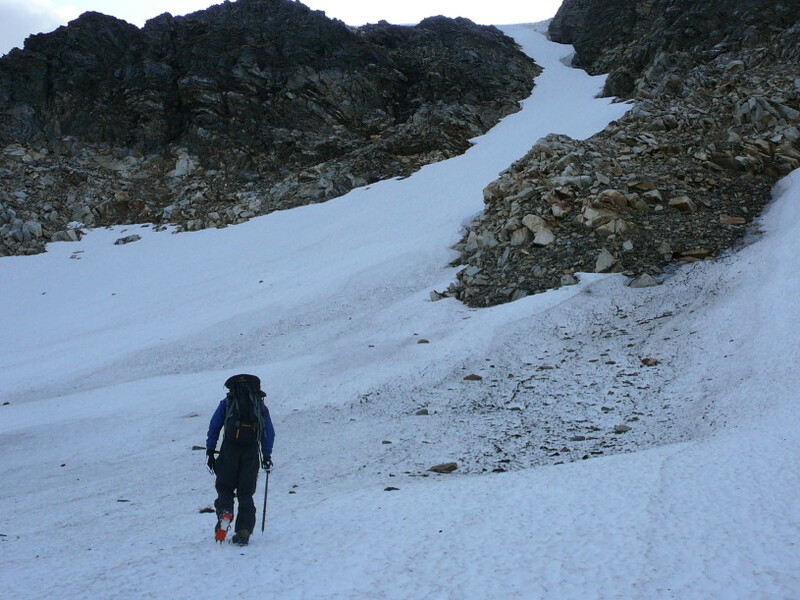 Having quitted Holmebugt at 8 P.M., they arrived on the summit at 1.30 A.M. by the East ridge. Descending in a N.W. direction they reached a glacier lake at 3 A.M. Thence, ascending over easy rocks and traversing an upper glacier, they gained at5 A.M.
the top of LALABAKTIND (FIRST ASCENT) (aka Sennedalfjellet, 1395 m), which is the highest summit of the group. 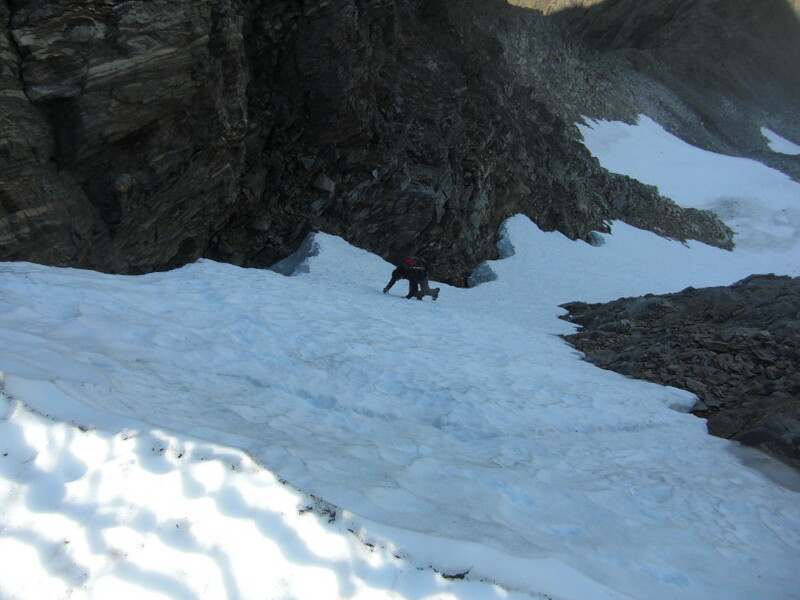 was made by narrow snow couloirs down the east face, the fjord being reached at 11 A.M. The weather during the morning was fine. 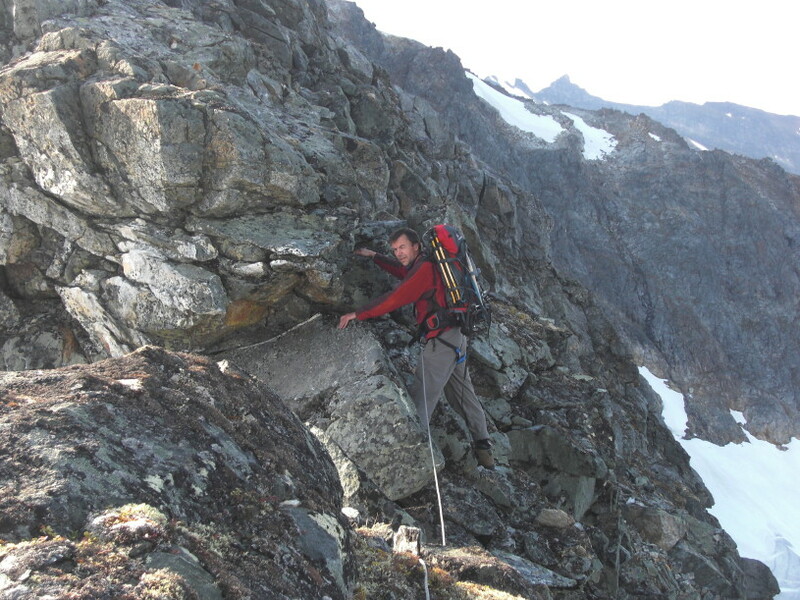 The North face was climbed by Kent-Hugo Norheim and Geir Jenssen on August 30th 2009.
just prior to reaching the summit. The approach to the couloir is rather complicated. See the map and the pictures below. 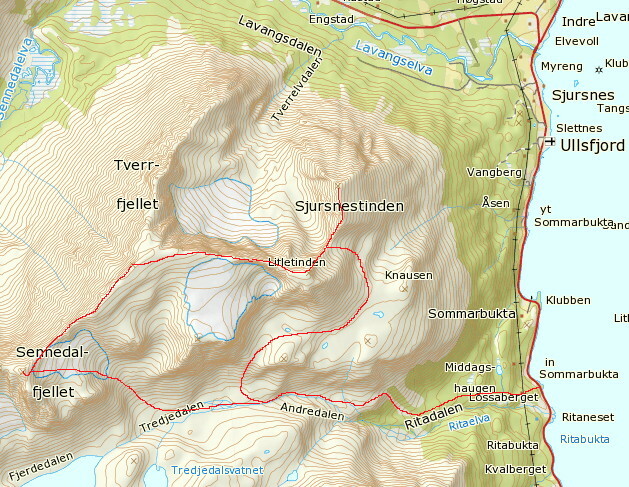 The traverse over Sjursnestinden, Litletinden, Tverrfjellet and Sennedalfjellet. Climbed by Kent-Hugo Norheim and Geir Jenssen, 30. August 2009. It took us 13 hours! 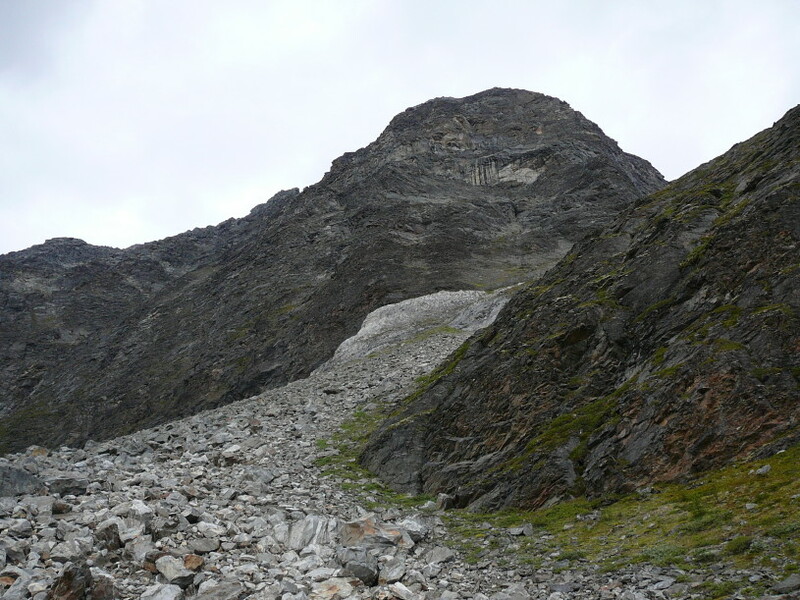 The scree that we climbed from Tredjedalen towards Point 909 south of Litletinden. 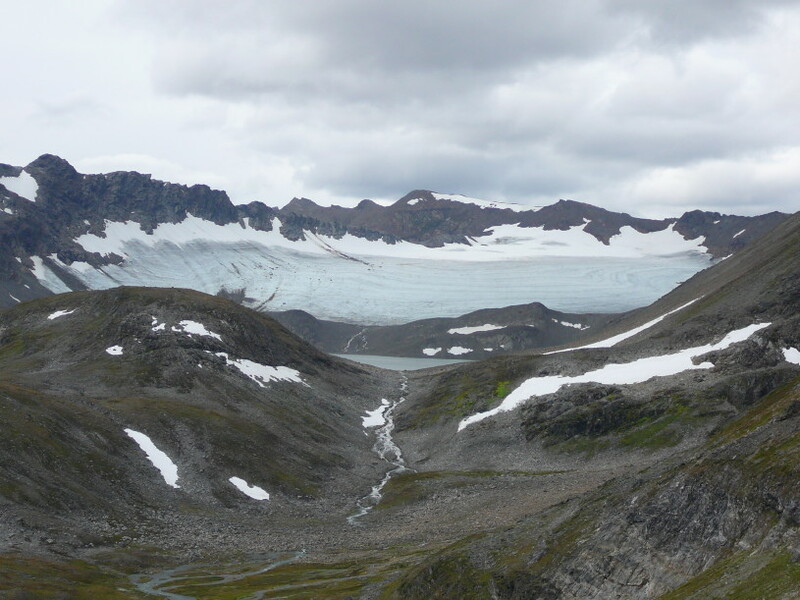 A view towards Fjerdedalen, Fjerdedalsvatnet and the Blåisen glacier. The Sami name for the lake and the glacier is Jietnjajavrrit and Olmáijietnja respectively. 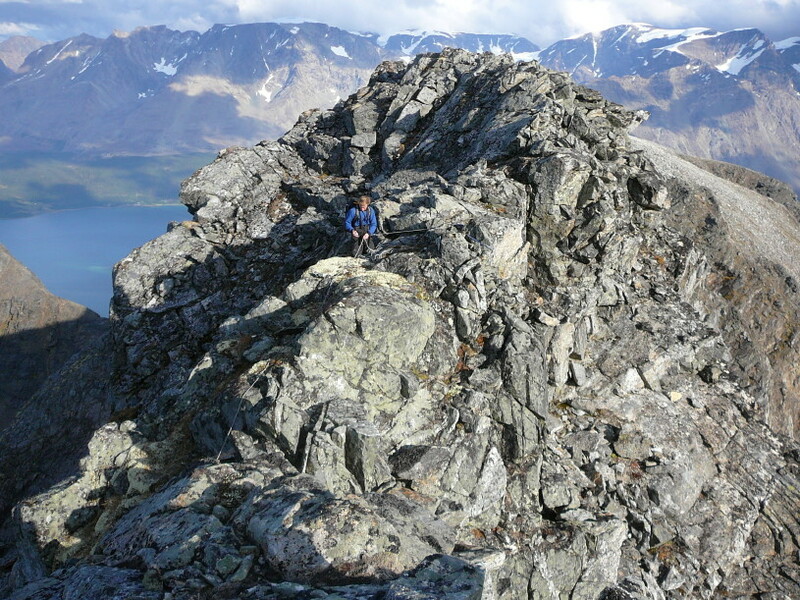 A slightly difficult rock band - before reaching the South ridge - was climbed by following the grassy ledges in the center of this picture. 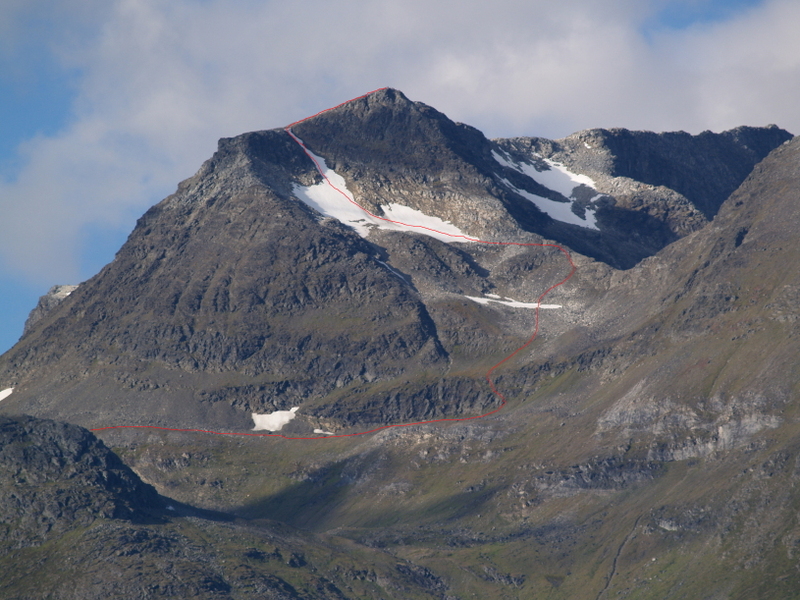 The summit of Litletinden was reached by climbing a couloir (40-50°) on the North face of the mountain. The couloir begins as a very broad slope which gradually narrows and steepens to a small notch just prior to reaching the summit. Looking towards Tverrfjellet (1394) from Litletinden. 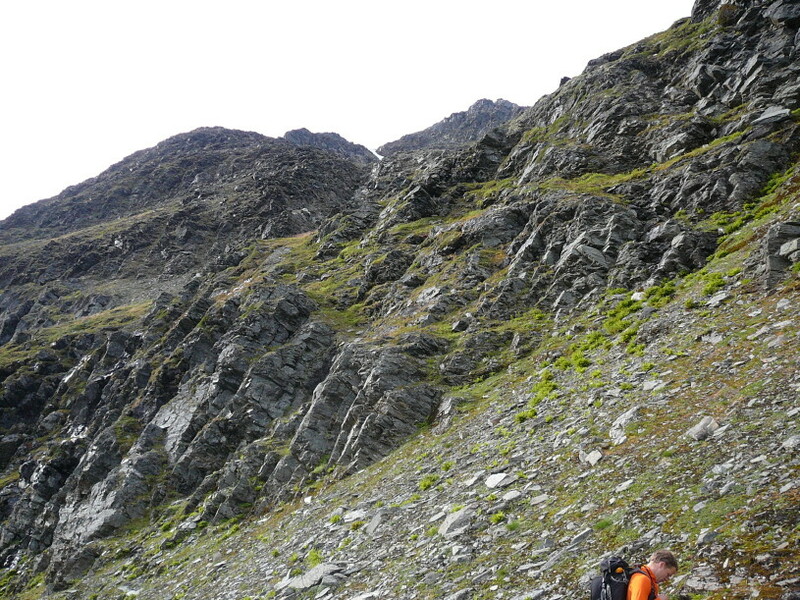 The East ridge of Tverrfjellet (right) was more difficult than expected with huge drops on each side. 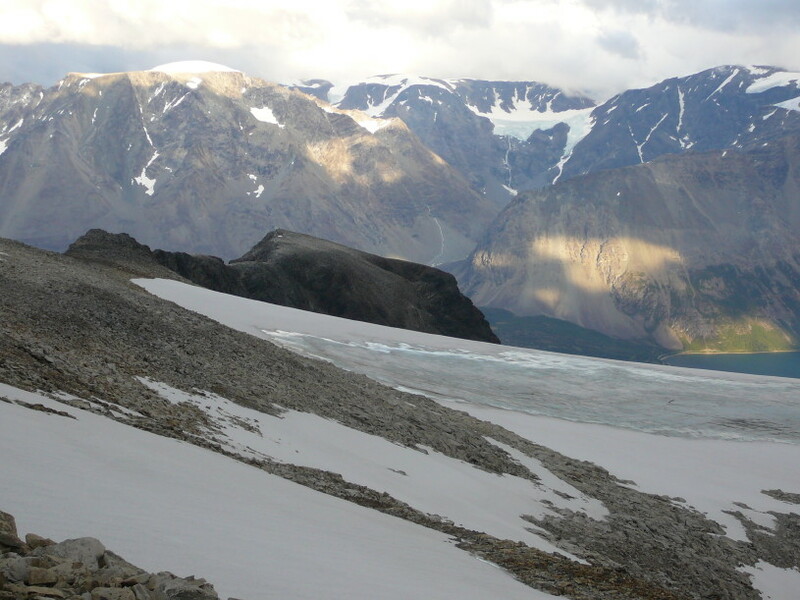 The glacier southwest of Litletinden. 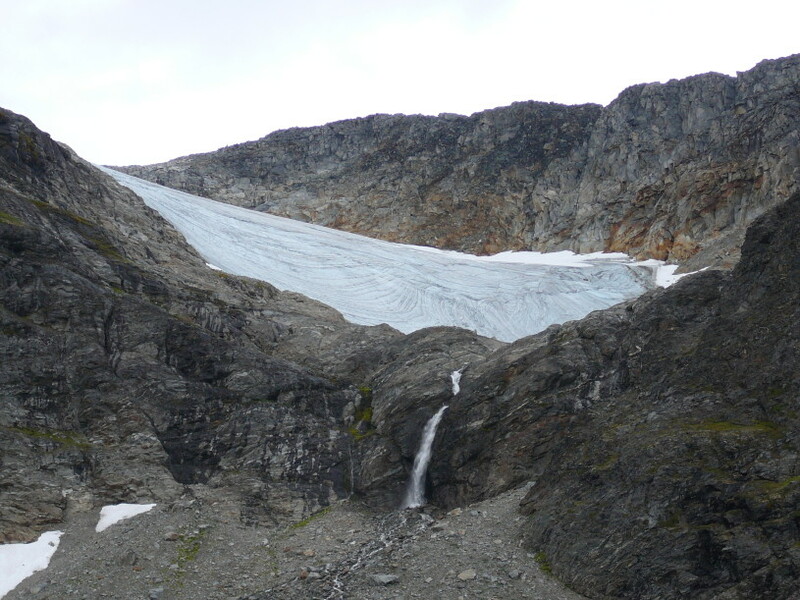 The Sami name for this glacier is Stuorra Cuonjajietnja (Store Gåsebreen). Easy climbing along the ridge between Litletinden and Tverrfjellet. The rock was surprisingly solid. 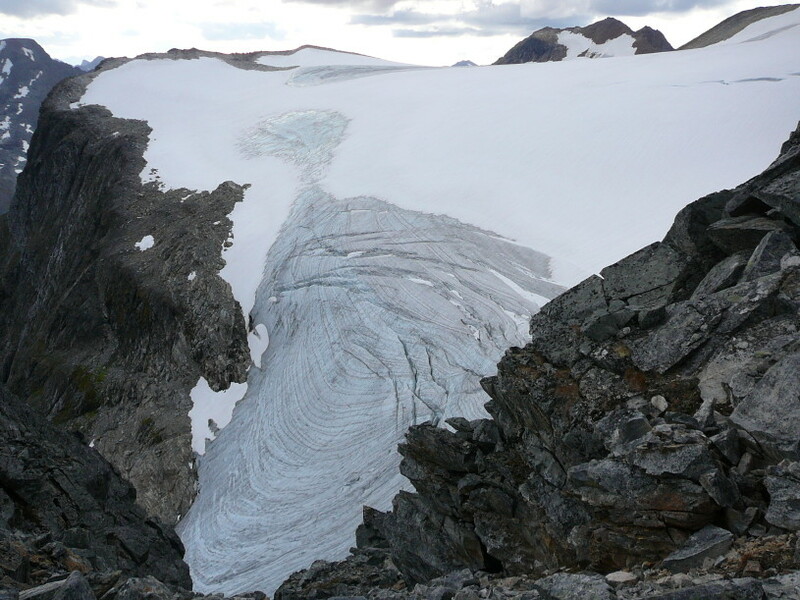 As Mr. Claud Rawlence wrote in Alpine Journal 1900-01: "A narrow and interesting ridge." 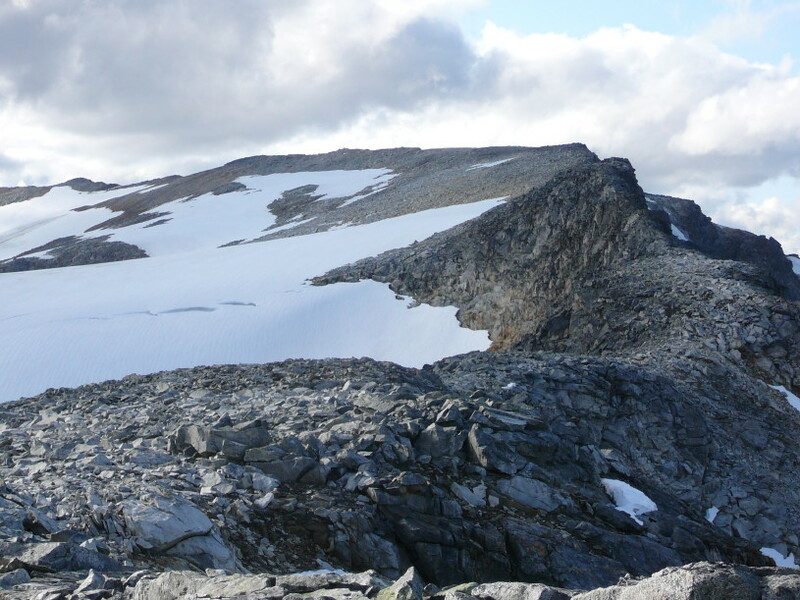 The ridge between Litletinden and Tverrfjellet as seen from the approach. Litletinden (the black mountain) as seen from the summit area of Tverrfjellet.